I woke up this morning and immediately switched on the TV to check the result of the Germany-Italy semi- final match up in Euro 2012 played a few hours earlier ( Philippine time) in Warsaw, Poland. Instead, a shocking news reverberating from London greeted me. 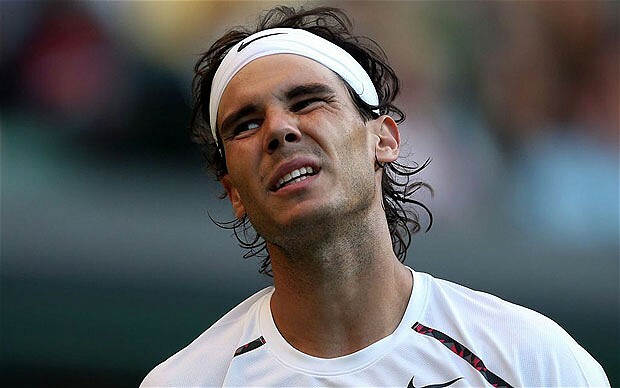 Rafael Nadal, the world's No.2 and the tourneys 2nd seed, and just a few weeks ago, a big winner( a record 7th title) at the French Open was ousted in the 2nd round in 5 sets. Not so soon I said. It's still the early stage of the tournament when top seeds use this as warm-up sessions. And I don't even intend to write about Wimby till next week when the critical Round of 16 starts. I don't think my friend and tennis partner and a Nadal fan Matt in California would believe the news. And since this is still the 2nd round, I was sure the giant slayer is an unrated, unknown and maybe just even a mere qualifier. And he is really sort of that. From now on, his name will be etched in the history of Wimbledon and tennis. He is Lukas Rosol, from the Czech Republic, and seeded 100th. Consider his credentials: this is his first Wimbledon and has never won an ATP match in grass since 2005. And how he ended the match: he fired an ace at love. I have always viewed such upsets as highly possible and probable. Players ranked as low as 150th have the capacity to win against top players at any given day. They have already that skill,the power, speed, stamina and the hunger for recognition to ambush any top player on his off day. What these unheralded players often lack is mental composure, concentration and consistency that can be taught only by experience. I have watched Rafa's opening game. Also against an unrated Brazilian player, he fell behind, 0-4 in the first set before rallying for an eventual easy win. It could not be a sign of course since sometimes they lose the first set only to be fired up and win. But this is no doubt a huge upset, far bigger even than the early exit of another great, Pete Sampras, in 2002 to another unknown player. But that was because, as observers pointed out, Sampras was already then going down the hill while Rafa now is still at his peak. Oh well, is this good news for Federer and Djoko fans? Going back to my original objective. This morning, my surprise and disappointment was completed. My bet, Germany lost, clearly and convincingly, to Italy, 1-2. And with Spain eliminating another personal bet, Portugal on a shoot-out ( it's painful to lose this way ), my misfortune on guessing winning games continue. Spain vs. Italy? Can't figure it out now. Ha ha ha! Let's see how the road to Kiev looks like.